I've read a fair number of books lately (yes, i'm actually quite proud of that fact considering that i have hundreds of pages to read for my masters program), and i will briefly name and comment on them in a second, but instead of a book review i come to you with a news article today which i read last month and that really impressed / moved me. 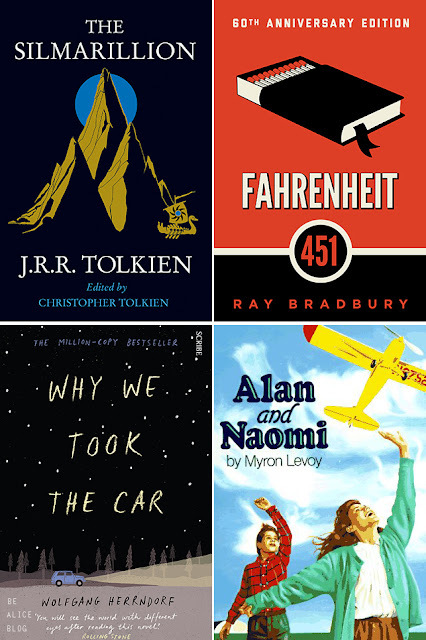 The books i read last month included Fahrenheit 451 by Ray Bradbury which actually almost disappointed me (i can't really put my finger on it, but i really struggled with reading this thing, even though i'm sure it has its value and was revolutionary at the time of its publication), Adam and Naomi by Myron Levoy (which surprised me with its sensitive, very relatable depiction of emotions and the development of friendship), Tschick ("Why We Took The Car") by Wolfgang Herrndorf (a rather unusual roadtrip novel across the roads of a summery glowing Germany), and The Silmarillion by JRR Tolkien (yes the one who wrote The Hobbit and The Lord of the Rings) which was very interesting to read. I have been in love with The Lord of the Rings as far as my childhood memories go back, and so i was extremely curious to dive into its background story, the huge complex myth that Tolkien constructed around his Middle-earth universe where most of his stories then take place. I have to admit i couldn't really keep track of all the very similar names of the countless Elves and humans, but especially the core story of Beren and Lúthien (which is the prefiguration for the love story of Aragorn and Arwen later on), as well as the story of Túrin Turambar and the emergence of Melkor/Morgoth and Sauron, caught my interest and were written quite vividly. Even though i totally lost sight of the relations between all the characters after a while! The aspect that fascinated me most about The Silmarillion was Tolkien's (successful!) attempt to create a heroic myth, a legend, a saga on the brink of fairy-tale and history, »of which there is far too little in the world«. He said that England had »no stories of its own«, but only such from Greek, Celtic, Romance, Germanic, Scandinavian and Finnish mythology. »Of course there was the Arthurian world, but powerful as it is, it is imperfectly naturalized, associated with the soil of Britain but not with English (...) For one thing its 'faerie' is too lavish, and fantastical, incoherent and repetitive. For another and more important thing: it is involved in, and explicitly contains the Christian religion.« (Quote from a letter by J.R.R Tolkien to Milton Waldman, 1951) Thank you, Tolkien, for these words and for gifting us with such a wonderful, dense cosmology! "Majestic" would be a good word to describe it, i think. Another book i want to talk about here is the novel Wolkenvolk: Seide und Schwert ("Silk & Sword") by German author Kai Meyer. I've read a couple of books written by him (the Wave Walkers trilogy and the Dark Reflections trilogy The Water Mirror; The Stone Light; The Glass Word for example), and to be honest, he is not the greatest author in my opinion - however i do really like his approach to mixing myth and reality, especially in the Dark Reflections series. He's really got some good ideas there: people being able to walk on water or walk threw mirrors, flying stone lions, horse-sized herons, sphinxes, mermaids with shark mouths, spirits, giant turtels and Chinese dragons set in historical locations such as China, Venice and Egypt... I feel like his storytelling and his literary language could use some improving, but the initial ideas are mostly pretty great. Fascinating! And perfect for those days when you just want to escape your own reality and dive into a phantastical stories. This article contains 60 photographic ads that deal with social, environmental, health and other issues. It was hard to pick a favourite - for me the 3 best ads are probably Nr 21, Nr 56 and Nr 58 (can anyone please explain Nr 30 "Now you see it, now you don't" to me?!). I've chosen this one as an examplary picture because to me it seems to be one of the most common situations in which we partake in a social/environmental discourse - propably without even noticing or thinking about it. I myself use paper towels in public toilets of course (how else are you going to dry your hands except with your own clothes? ), and even though i am quite conscious about the paper i use and waste (for instance, i always recycle by using the blank backside of any pages to scribble on my everyday notes) - but even so i sometimes find myself in a situation where i would rather use paper kitchen towels to wipe something up instead of a cleaning rag or an actual kitchen towel. And that's just laziness. So please be aware of the ways you are participating to the exploitation of our environment. 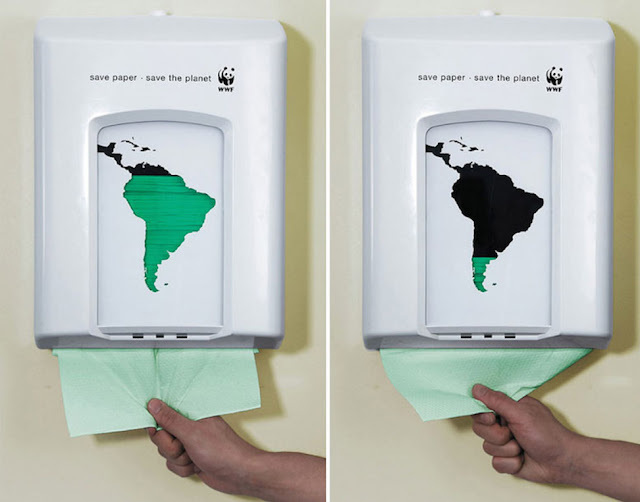 Do not waste paper. Use washable kitchen towels instead of throw-away ones. Use a cotton tote bag instead of plastic bags. Recycle where ever you can. The forests won't be here forever, and neither are the animals living in that forest. It's not YOUR world, so treat it with respect and concern.